Just a few days away from the classroom to relax and regroup, but thoughts and ideas still have a way of percolating, creating a full, steaming cup of ideas to warm the soul. We hope you enjoy every cup. We often put photographs or drawings up on our charts to give children a picture of what certain behaviors look like, such as sitting hip to hip or looking at your partner. Pictures offer children clear examples of the steps it takes to move from the table to the meeting area; from the table to the door. These are the kinds of charts we often create during the first days of school. But now that we have these basic routines and rituals in place, the time has come to look closely at the actual work our children are producing each and every day, which leads to the question: Do our children know what is possible? What is within their grasp as young readers and writers? When we think about reading and writing expectations we can think about: How many? How much? How often? How many books will you read or write? How long will you read for? How many sentences/pages will you write? Will you read in school and at home for 30 minutes each day? Will you write daily for at least 30 minutes a day? These kind of questions often lead to setting aspirations and goals. But what do these things look like? We realized that one thing we can do to make sure these “visions” are clear is to include actual examples on the charts we create. For writing, these examples can be pieces you have written, pieces written by children, or pieces written by published authors. Choose examples that are within, what Vygotsky called, your children’s zone of proximal development. In other words, examples that are within their grasp. But children don’t always know what is within their grasp unless they see others doing it or what others have already done. We have all experienced seeing one child making perfect copies of Power Puff Girls and then, within a month, it spreads like wild fire; everyone in the class has replicated the huge eyes and action outfits like cartoon pros. If imitation is the kindest form of flattery, then as teachers we want to be flattered all the time. Why not use our charts to create images that can be used to encourage, imitate, and inspire in ways that ignite fires in our classrooms. Children now know that the charts hanging up in our classrooms are to help them when they get stuck or forget what to do. Now we can teach them that they can also look to charts for inspiration and for examples of what is possible when they are writing. We call these charts “exemplar charts,” because they provide a visual example of what is possible and what is expected. The charts below illustrate two different ways teachers can tuck in exemplars into their lessons. This is a process chart that includes examples. 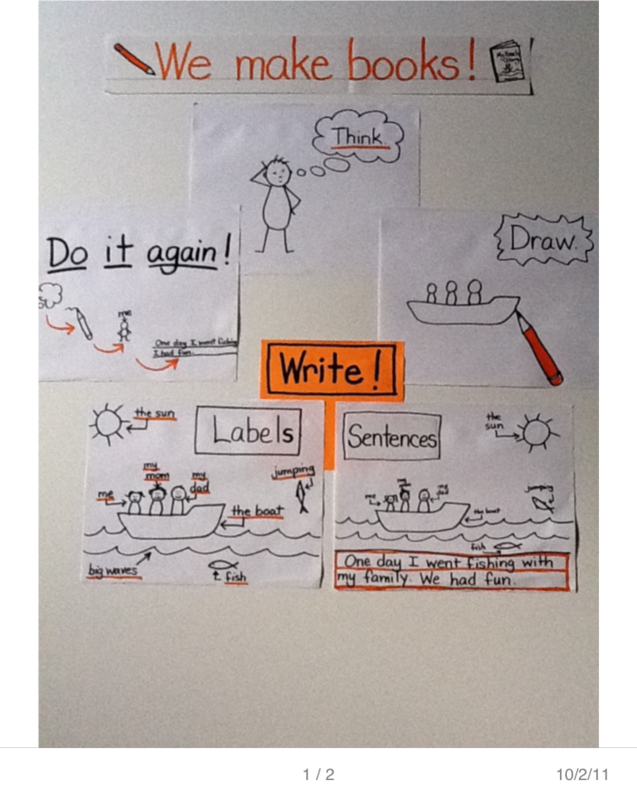 The first chart is a writing process chart created for a Kindergarten classroom. The basic process is there: think, draw, write, do it again. But in this case the teacher decided to include visions of what each part of the process might look like. Think and draw are pictured simply. But the “write” part of the process shows very high expectations, while also showing options for what it means to “write.” One picture shows lots of labels, including basic words like, ‘me’, but then also shows the addition of high frequency words, ‘my’ mom, ‘my dad, ‘the boat.’ It also gives an example of labeling actions with the fish, ‘jumping.’ You can also imagine labeling feelings and setting. While the chart is a process chart, it embeds very ambitious examples of what children can include as they write their books. The second chart is a volume/stamina chart created to encourage second graders to consider what they have been accomplishing and to make goals for what they might do to write, “more, more, more.” Our colleague, Shanna Schwartz, sings this song to kids, adding: How do write it? How do you write it? 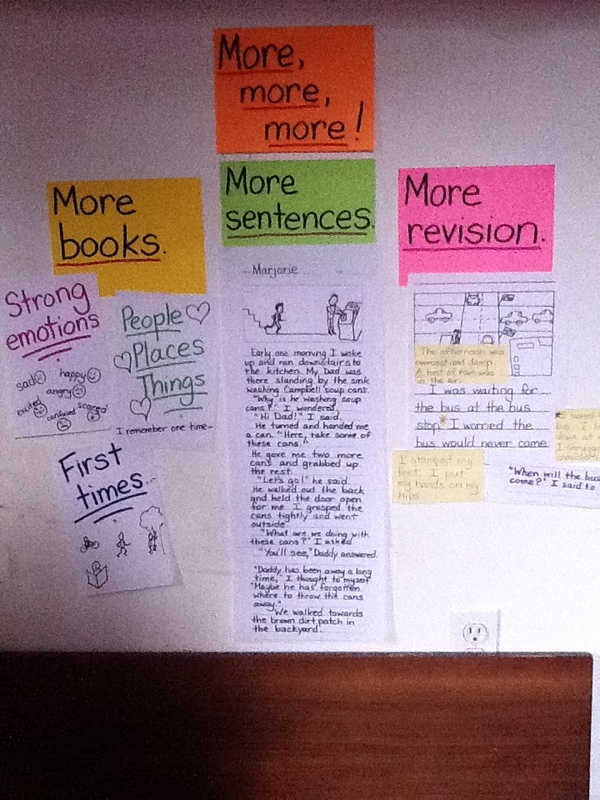 In this classroom, the teacher has included very specific examples of what it means to write “more, more, more.” More books, more sentences, more revision. These are very important messages to send to our young writers and makes it very clear what we mean when we say, “write more.” The chart also provides a measure upon which children can hold up their writing to and self-reflect on what they have done and not yet done. In other words, they have an exemplar that leads the way and sets very clear expectations of what is possible. Knowing what is possible opens up a world never before considered. How exciting is that!